Announcing PRESTO: a grant program supporting El Sistema-inspired programs in their first five years through funding, group learning, and mentorship. El Sistema USA is no longer accepting applications for its new Program for Rising El Sistema Organizations: PRESTO. Thank you to everyone that applied for the PRESTO program through El Sistema USA! The application period is now closed. We will be announcing our PRESTO grant cohort by the first week in July 2018. El Sistema USA received a one million dollar grant from the Paul M. Angell Family Foundation to support the growth and sustainability of the El Sistema movement in the United States. PRESTO will identify up to 15 members of El Sistema USA within their first five years of program activity and invest in them financially and programmatically. Through PRESTO, El Sistema USA will provide funding, mentoring, and training over a three-year period, beginning the Summer of 2018 through the Summer of 2021. El Sistema USA has partnered with the Duke University Center for Nonprofit Management to provide high-level professional development through a 3-year curriculum, where grantees will explore best practices in leadership and management, as well as topics specific to El Sistema-inspired programs. 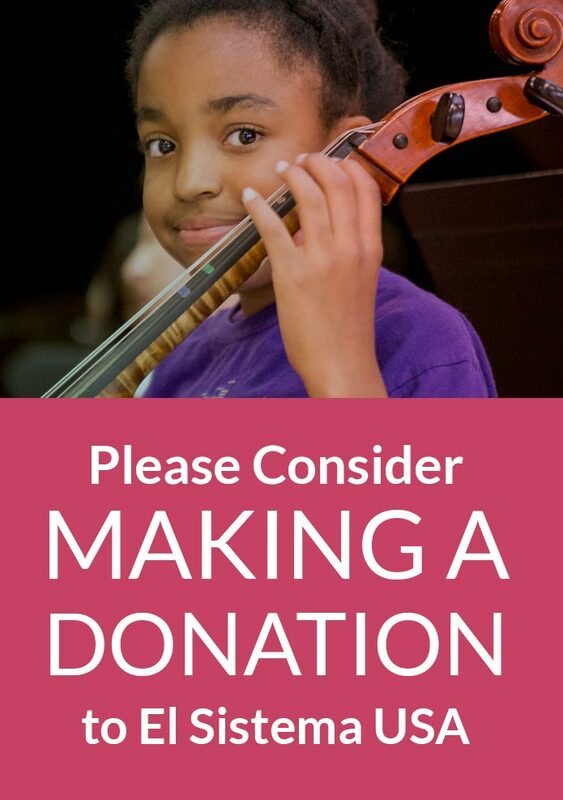 PRESTO cohort members will also receive matching funds to support their organization’s growth and capacity development and be paired with an El Sistema USA mentor to support their learning and PRESTO experience. Year Three: $10-$20,000 with no required match, but required presentations and reports to extend learning in the field. El Sistema-inspired programs provide no-cost music instruction to children living in poverty. ESUSA’s diverse membership across the United States represents programs that serve some of the most vulnerable communities and children in the country. We aim to provide connections to knowledge and innovation, advocacy, and leadership development for program directors, teaching artists, students, and volunteers. Members collaborate to share resources, values, aspirations, and advocacy efforts. ESUSA serves three major purposes: strengthening existing nucléos through capacity development and research, encouraging the formation of new nucléos through providing resources, connections and training, and building awareness of El Sistema at large throughout the United States. Does our organizational leader need to make a three year commitment, or could the grant period be finished by his/her successor if s/he leaves the program before the end of the 3 year period? One of the eligibility requirements for the PRESTO program is that the lead applicant plan to remain in an executive leadership role with PRESTO for the full 3-year commitment. We do this because the program will be centered around the expressed needs of each organization and organizational leader that participates. We are not a currently 501(c)(3) designated organization, but we have a fiscal sponsor. Are we still eligible to apply? It is okay if your organization does not have their own 501c3 designation. You are eligible if you have a pending designation or you can apply with your fiscal sponsor, as long as they have the designation. Our organization is more than 5 years old, but the programming we are applying for is younger than 5 years old. Are we still eligible? Yes, as long as El Sistema-inspired aspect of your programming is between 1 and 5 years old, then you are still eligible to apply for PRESTO. Does fundraising we already do count toward the PRESTO grant or does it need to be unique funds, raised expressly for use as a match for PRESTO? Yes, you will need to raise separate matching funds for the PRESTO award, as it is designed as a capacity building opportunity. No, you will not be able to count current donors or donations. To view the video tutorial, click here. To view a document of the written tutorial, click here. How does the match funding work? We determine the amount of financial support awarded based on the member’s application. Then from that amount, you pay 50% of the match from new philanthropic funds in the first year, and 100% of the match in the second year. For example: in Year 1, if you receive $40,000, your required match would be $20,000. In Year 2, if you receive $30,000, your match required is $30,000. In Year 3 you mention there will be required presentations and reports required. To whom will these presentations and reports be presented, and how often? At ESUSA’s annual symposium, cohort members would be required to present to the field regarding updates on their learning throughout the program. At the end of the program, each member will write a report detailing what they have accomplished and present that to the symposium. This is open to and attended by all ESUSA members. Can you tell me any information about dates of travel required for PRESTO? This program includes a mentorship component, thus the cohort member and their assigned mentor will visit each other’s sites once during each year. These visits will be covered by El Sistema USA outside of the granted award. Additionally, attendance at the annual symposium will be required, and covered by ESUSA. There will be two in-person training dates (one of which takes place at the symposium, and one at Duke). Again, the travel will be covered by ESUSA. The training dates of these will be at the beginning of August every year and the national symposium will take place in January every year (the 2019 conference will take place in Detroit). Everything else the cohort will be involved with is virtual!